Duane Harte, SCVHS Board Member, Named Man of the Year. Named Man of the Year. Duane Harte, one of our newest SCVHS board members, was named Santa Clarita Valley Man of the Year on May 16. Duane was honored for his longtime volunteer work on behalf of more organizations than anyone can remember. 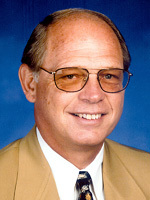 Among his current titles for 2003 alone are: President-Elect of the SCV Chamber of Commerce; Chairman of the City of Santa Clarita's Newhall Redevelopment Committee (and past Parks Commission chairman); Director (and past president) of the Friends of Mentryville; Vice President of Friends of the Libraries; Vice Chair of the SCV Parade Committee. He's also involved with the SCV Committee on Aging and the Elks Lodge and probably several other groups that we're forgetting. Of course, he's corresponding secretary for the SCV Historical Society, and we're all happy for Duane and we're looking forward to piling a bunch of responsibilities onto him this year. Congratulations also go out to longtime community do-gooder Linda Pedersen, who was named Woman of the Year for 2003. You may remember when Linda covered social events for The Signal under the pen name of "Carolina Kelly" in the 1970s.